better than i could have imagined: Deck the halls! I did get around to decorating our mantle this year and I kind of like it. I do think it's missing something, but it hasn't come to me yet? My favorite thing is this Christmas tree subway art. 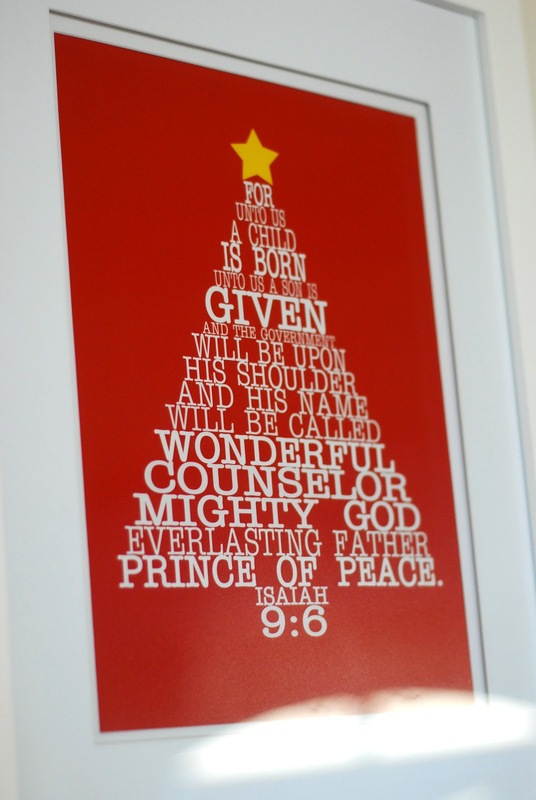 I love this verse from Isaiah...prophesying the coming of the Messiah over 500 years before Jesus' birth. 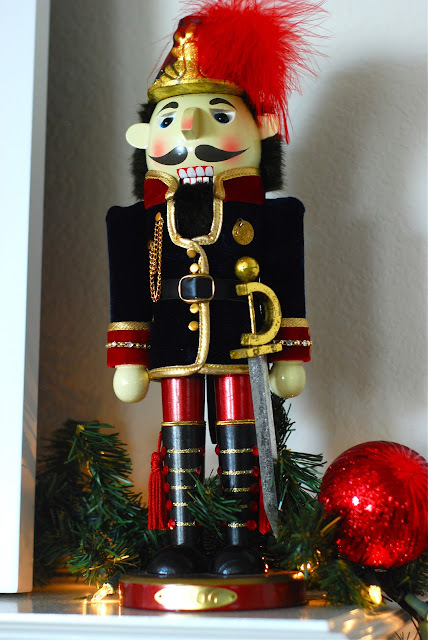 And this nutcracker. My dear friend, Amy, got this for me and Geoff our first Christmas we were married and I love it. So does Parker...except she wants to play with it and I do not let her because I want it to actually last! And our stockings. I love our stockings. I ordered them from Pottery Barn the Christmas before Grace was born knowing that these would be our stockings forever (or at least for a long while). And wouldn't you know- they no longer have these. And with the addition of baby boy next year...that leaves me with a problem. I did get a stocking pattern last year that I never used...so I'm thinking about making our stockings for next year. We'll see! 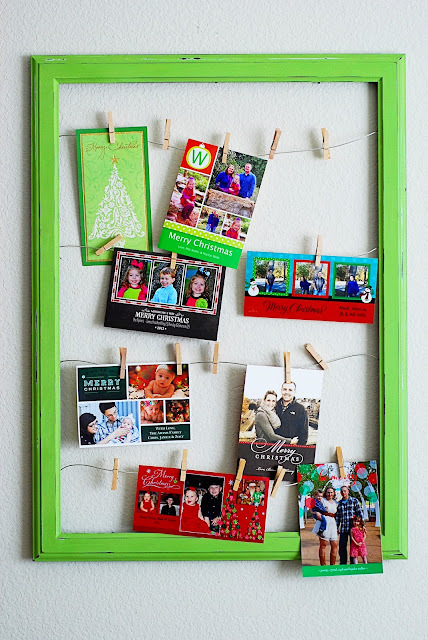 In years past...I've always displayed our Christmas cards along our mantle. I knew I wanted to do something this year...and after making this frame for displaying our instagram photos...I knew this would be the perfect thing. It's hanging in our kitchen so we're able to enjoy them more this way. And this is our Christmas tree. So we decided to actually go to a tree farm and cut our own this year. And while it was a good experience making lasting memories....I do not think we will be doing it again. This tree isn't the prettiest tree. ;) We only put up maybe 25% of our ornaments because it was hard to find branches that are strong enough to hold the ornaments. The good thing is...I put on lots of lights.... which I think helps! I took a strand of lights, strips of Christmas fabric, and tied them around the lights. Its really cute with the lights both on and off. I did this last year and got the idea from The Vanilla Tulip but I can't find the link. We didn't really do much on the outside either. One day, one day. Another new addition this year is this mesh wreath. 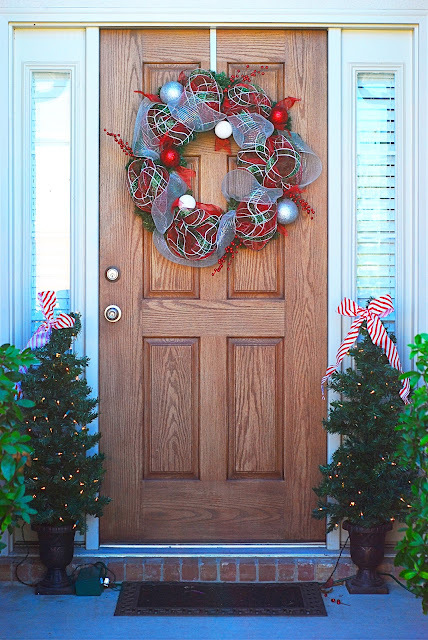 I looked up DIY Christmas wreaths on pinterest for inspiration...and came across this one. She has a wonderful tutorial. I feel like these wreaths are really big...even a little over the top. A little different than what I usually go for. But for whatever reason- I am loving these big, over-the-top wreaths right now. I would like to add a little something to the center of this wreath like in the tutorial, but this is as far as I got and I'm happy enough with this. I think I see more mesh wreaths in my future. And that's about it! Hoping to get some pictures of the girls tomorrow for our Christmas cards. I realized just a few weeks ago that we didn't send one out last year, so I really want to this year. And I wanted to do a family picture, but it's just not going to happen. So I'll settle for our sweet girls instead. Stopping by from Kelly's. So pretty! I love the Little People nativity and the wreath on your front door. :) Great job! Beautiful decor! 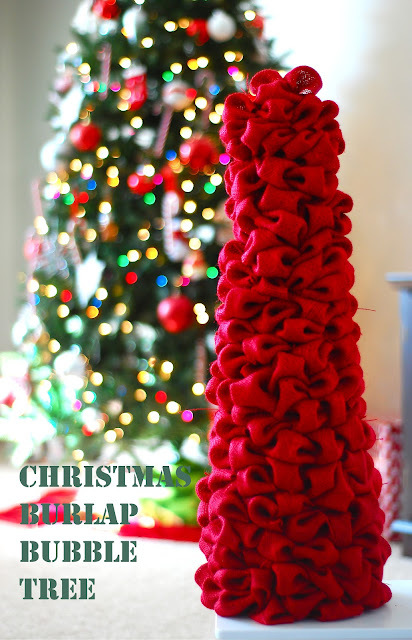 I just love the red burlap tree. And I love that your stockings say Mommy and Daddy - precious! Everything looks so pretty. Your mantle is lovely. Could you drape some red/gold beads over the mirror? 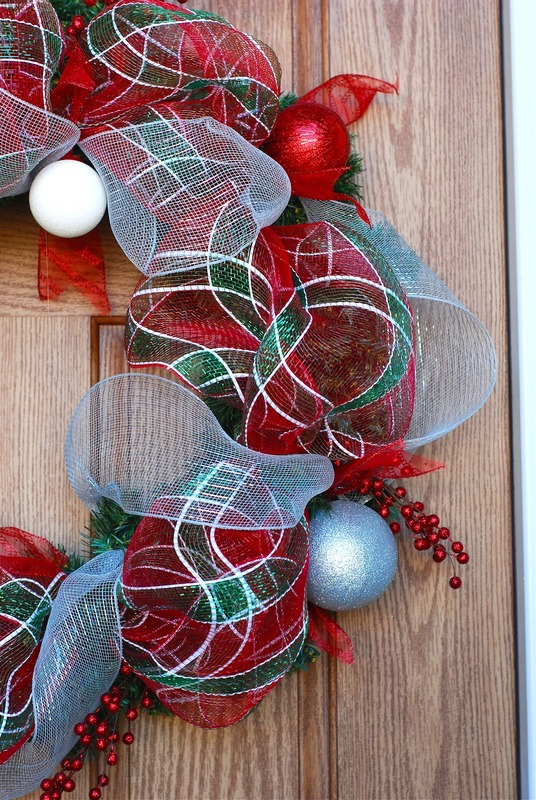 Or, make something to put around it with fabric and mesh....like in your wreath? You seem to be very crafty and I think something around the mirror would accent all the great items. I LOVE your stockings and the Subway art, too! Merry Christmas! I love your burlap tree, and your wreath. What beautiful decorations! 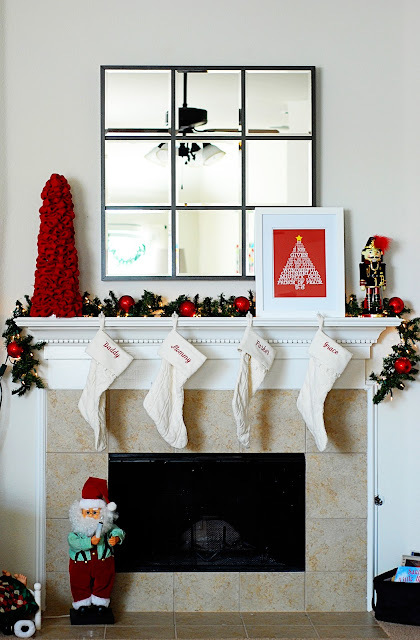 I really like the splashes of red on the mantel! I love your fabric wrapped light! I love it all! Very simple and clean and cheery :). I really like the card holder - very creative!! And, the mantle looks wonderful! Your decorations look great. I know what you mean about wishing you would put out more... I do the same thing. LOVE it!! Please tell, where'd you get your Christmas tree subway art? I love all the decorations! 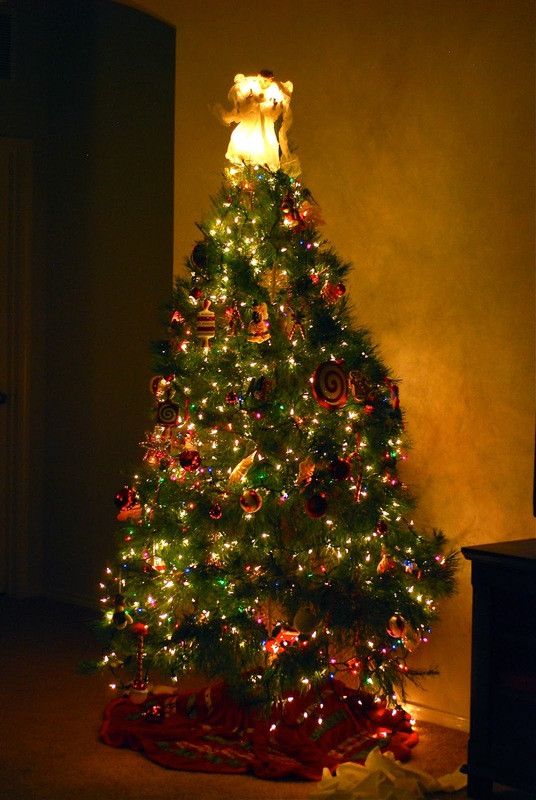 The tree turned out great too! Love the idea about the Christmas cards! stunning. very simple yet elegant. love all of the decorations especially the burlap tree!